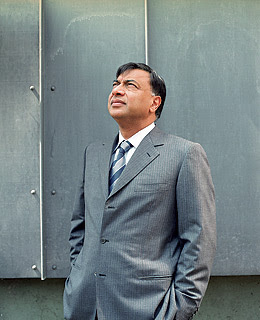 Indian immigrant heads world's largest steel company; ArcelorMittal was formed via hostile takeover three years ago. Stock in company makes up bulk of his fortune; shares at a four-year low, with steel prices down 75% since last summer. Company forced to pay heavy fines after a French antitrust investigation found 10 companies guilty of price-fixing in European steel markets. Arcelor posted $2.6 billion loss in most recent quarter; announced plans to slow acquisitions, cut capital expenditures, pay down debt. Started in family steel business in the 1970s, branched out on his own in 1994. Initially bought up steel mills on the cheap in Eastern Europe. Company bought 19.9% stake in Australia's Macarthur Coal last year. Also owns pieces of Mumbai's Indiabulls Group, London's RAB Capital; owns stake in, sits on board of Goldman Sachs. Holds substantial cash; owns 12-bedroom mansion in London's posh Kensington neighborhood.